I’ve finally gotten around to photographing more of the house updates. 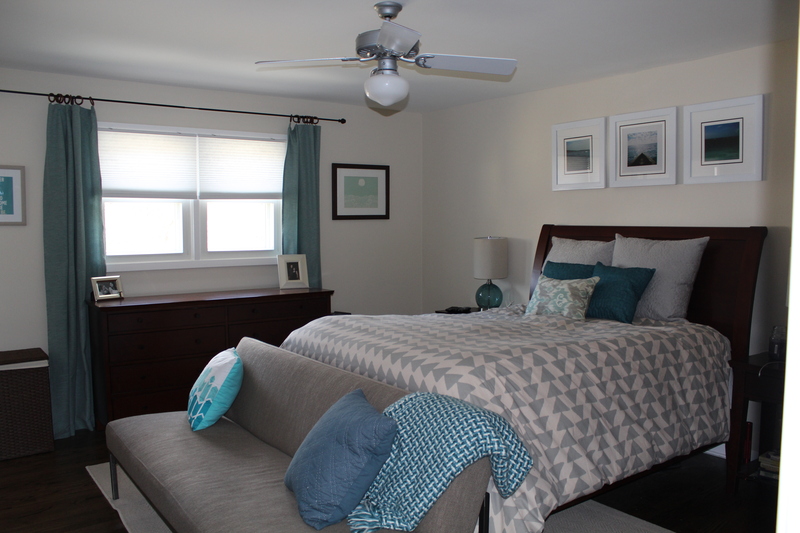 I thought I’d resume the house tour in my favorite room – the master bedroom. I’ll start this post the same way I started the one on the guest bedroom, with a before photo. Pink walls. Pink carpet. 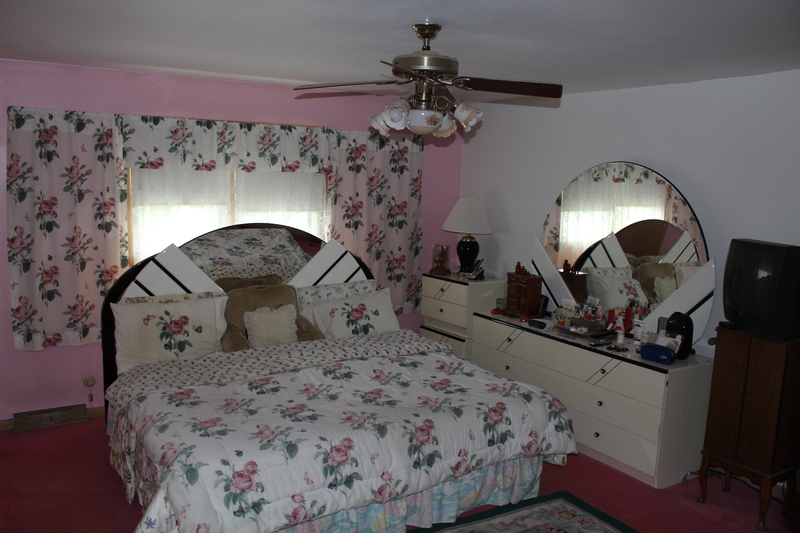 Floral drapes and bedding. ’80’s-ish furniture. A fan with roses on its main light. Here’s what it looks like now, from the same angle. This room was actually one of the easiest room updates we did. All we did was take up the carpet, have the wood floor sanded and re-stained, and painted the walls and trim. We already had most of the furniture from the apartment, but we bought a new duvet cover ($15 on clearance from Urban Outfitters), rug ($99 from Target), and end of bed bench ($1,299 from Room and Board but only $160 on craigslist), along with creating most of our own wall art. The inspiration was beachy, but focusing on the water element and not the traditional beach decor of seahorses, sand castles, and everything else associated with beach houses. The reason is simple. We’ve taken some trips to beaches and love a good Saturday morning on Lake Michigan here. The room feels tranquil with its neutral color palette, but also playful with the triangle duvet cover. We’ve also tried to throw in pops of personal meaning, mostly in the wall art around the room. More on that next time.